I was impressed by the design of the Effekt bridge in Denmark. 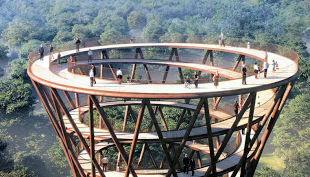 The bridge consists of a spiral around a hyperboloid, allowing visitors to enjoy 360° treetop views. Our challenge is to model the spiral shape of the bridge. That is, we seek to find the equation representing this spiral. 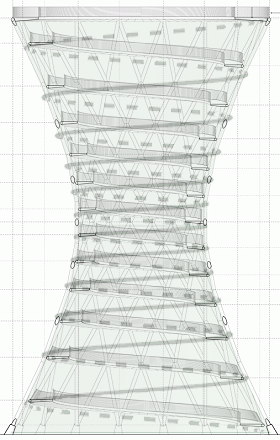 First, we aim to draw the hyperboloid. It is not really necessary for this exercise, but it's good to be able to check that any spiral we find actually does hug the sides of the 3-D shape. 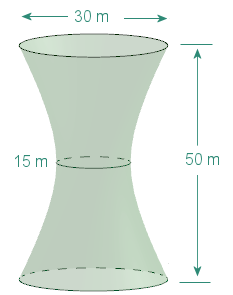 We want the middle of the hyperboloid to have a radius of 7.5 m, so we choose a = 7.5. Now we need to determine the value of c.
At the base (and top) of the hyperboloid-shaped bridge, we need the value of x (and y) to have value 15. So we need to solve 7.5 cosh(v) = 15, to find the value of v there. Once again, using Wolfram|Alpha we get c = 14.38. 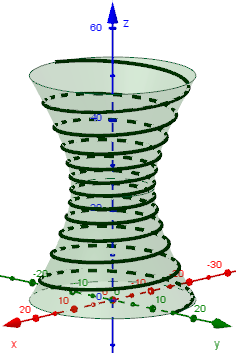 The value 7.5 is the same as the hyperboloid case (since we need the "waist" to have a 7.5 m radius) and the cos(u) and sin(u) terms are necessary to make the spiral curve its way around the outside of the hyperboloid. We need to determine the d, m and n values so that we'll have the correct spiral shape, and the correct number of spirals. At the top of the spiral, the z-value for the curve needs to be 25, and the x- and y-values need to be 15. This is one equation in two unknowns. Normally we can't solve such an equation, however we can choose a suitable pair of values for d and n as follows. 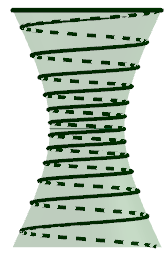 Hyperboloid spiral with base on x-y plane. Let's now check our hyperboloid and our spiral to see if we have done it correctly. Here is my solution overlaid on the original schematic of the bridge. It's close, but some of the path levels are a bit higher than my model, and some are a bit lower. This could be due to engineering requirements, for example placement of the supporting beams that may have conflicted with the "perfect" spiral that I have modelled. 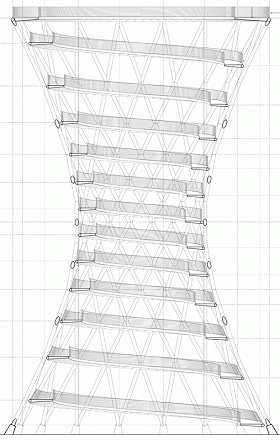 Our model for the spiral around a hyperboloid, approximating the EFFEKT tree top bridge in Denmark, seems quite reasonable. It is an interesting real-world application of mathematics. The above graphics were obtained using Geogebra, an invaluable tool for this kind of task. I used several sliders for the variables involved so I could better check what effect each variable was having on the final outcome.